Carter Mountain plays a role in Virginia’s nationally-acclaimed wine scene, thanks to the Carter Mountain Vineyard. Since it’s planting in the spring of 1998, our vineyard has produced a variety of grapes including Chardonnay, Cabernet Franc, Merlot, and Cabernet Sauvignon, to name a few. You drive between our vineyards as you come to the top of the mountain, and once you arrive, you can taste the wine (talk about “farm to glass”!). Carter Mountain Orchard has partnered with Madison County’s Prince Michel Vineyard and Winery, which has held a dominant presence in Virginia for over 30 years. Prince Michel has been using Carter Mountain grapes to create their award-winning wines for years. The venture to open a tasting room at the very site of the vineyard is now a successful reality! Nestled along-side the Carter Mountain Bakery and Country Store, our Wine Shop boasts wine tastings of Prince Michel’s wines — some of which are exclusively made from Carter Mountain grapes. All nominal tasting fees are donated to local charities. 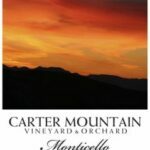 Both Carter Mountain and Prince Michel are thrilled with this opportunity to bring more tastes of the mountains to you! In 2010, we started our “Sunsets on Carter Mountain” summer series. From mid-May through September visit us at Carter Mountain until 8:30PM on Thursdays for live music, wine and food, and spectacular vistas. “Like” the Wine Shop on Facebook to keep up to date with schedule of entertainment and other wine news! 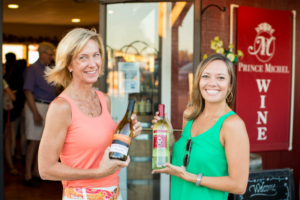 The Wine Shop offers private wine tastings and wine parties for groups and/or companies. We also offer private label wine for weddings and other special events. Please call 540-407-0339 for more information.